They were gone now, and the garden was quiet. Jesus had been arrested, His disciples scattered. As for me, I am compelled to remain here, allowing what I had seen and heard to seep into deep places. “…not as I will, but as You will.” As I watched Him, the words echo familiar to me. They have flowed easily from me over the years. “Not my will, but Yours be done!” “I just want God’s will for my life.” “Lord, have Your way!” I see Him there, on the ground and I hear my voice speaking out those words. And I see Him there, on the ground sweating blood and I hear my voice. And somewhere inside of me something is tearing. Something hurts. Something that was hidden in darkness is backing away from the light coming in…but it’s too late. I followed Him here, and He exposed my heart. Everything in me wants to lay on the ground where He had been, to press my cheek into the dirt still wet with His tears and sweat turned to blood. I want to capture it all, this war between flesh and Spirit, and hold it tightly somewhere inside of me. Because I want it to change me. 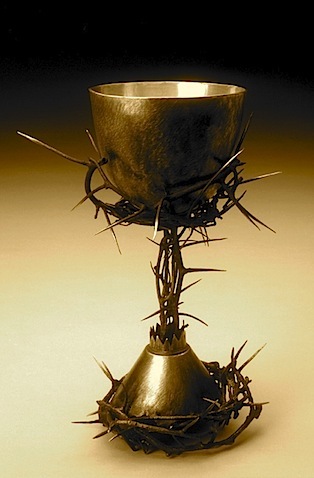 I listened as He asked for the last time…”if it is possible, may this cup be taken from Me…”. I heard no response. Maybe He did. Maybe His Father spoke words of comfort and strength to Him. Maybe He heard nothing because sometimes the silence of God says everything. Either way, it was done. He took the cup and set His face toward Golgotha. Death for Life. Victory was secured. I followed Him here and I learned. “Not as I will but as You will” are the words of battle. Jesus didn’t enter Gethsemane and surrender His will so that I wouldn’t have to. He did it so that I could. He overcame so that I could overcome. Death for life. Not a drink to be sipped. It is a cup to be taken hold of with both hands and swallowed down. It is hard. Agony. Weeping and falling face to the earth in surrender. It is the prelude to victory. And you wrote this LAST year? It’s funny, I thought I had read all of your blog posts..how did I miss this one. He is at it again isn’t He? Of course you know what I am going to say don’t you…He is in the details. My name is Jan Gauntt. I live in Topeka, KS. My family knows the Shipman’s very well. We have come and visited often. Lyndsey, my daughter, has spent quite a bit of time there with Courtney. Anyway, thought you might know of us. I really enjoy taking in your writings. I love your style. It is deep, but not unable to be understood or identified with. Quite the opposite. It awakens the creativity and desire to express what God has conceived inside our very soul. Keep writing, keep drawing from that deep place. It is moving. Thank you for taking the time to get it written out for us all to be able to read and reread and let it all sink in. Hi Jan! It’s good to meet you. And thank you so much for your encouraging words! It really is good to hear that what I’m writing is ministering to someone besides me! Thank you! And thank you for reading my blog. “it is the prelude to victory” – good thoughts & a powerful, statement. Thanks Dave. I’m still letting it sink in and take root in me.